Snowglobe Basic script in Marketplace. SET UP: WHAT SCRIPT TO USE? We need to use ONLY ONE of them in a given product. Which one? How to choose? The [MODULE] version, as explained in the THE MAIN SCRIPT, AS A MODULE YOU CAN USE FROM ANOTHER SCRIPT section, will allow you to use this script integrated with other scripts that allow sending linked messages, such as the Multi Love Pose (MLP) or AVSitter for multiavatar, multianimation devices. Once we've chosen the right main script, we have to set some descriptions in the primitives of the object, following the instructions below. We'll understand better what this means by examining the [Black Tulip] Snowglobe - SCRIPTED SAMPLE object. Rez it, and let's follow this explanation. Before anything, right click the object to edit, then click the "Content" tab. When we do this, we're inspecting the contents of the ROOT PRIM. You should see the "[Black Tulip] Snowglobe - Basic Edition MESH" script. That the script and texture for particle effects, if any, have to be dropped into the ROOT PRIM. This is the default when we simply right click an object, then select "Edit" from the menu. The sample object has no particle textures used (and so particles will show as a little dot), but you can drop your texture and set it up as indicated later. What do these descriptions mean? That's what we cover in the next section. If you rez the sample [Black Tulip] Snowglobe - SCRIPTED SAMPLE object and click it to get the menu, you'll see, as soon as you select ON/OFF to start all the effects, that the winding key spins. But there it is only one prim that will be the snow emitter, only one prim that will be the light point, and only one prim that will have the texture animated. We may want a primitive being, at the same time, animated texture AND snow emitter. Does it matter if we write first snow, light or any other? It matters not. Write them as you prefer. Only what specifies how the prim will spin has a very specific format to be respected, but that is explained following. Set the DESCRIPTIONS according to these simple rules, drop the main script in your linked object, and your snowglobe is ready to go! We have to begin by rezzing our object. Don't worry if your object doesn't look like you have designed it. 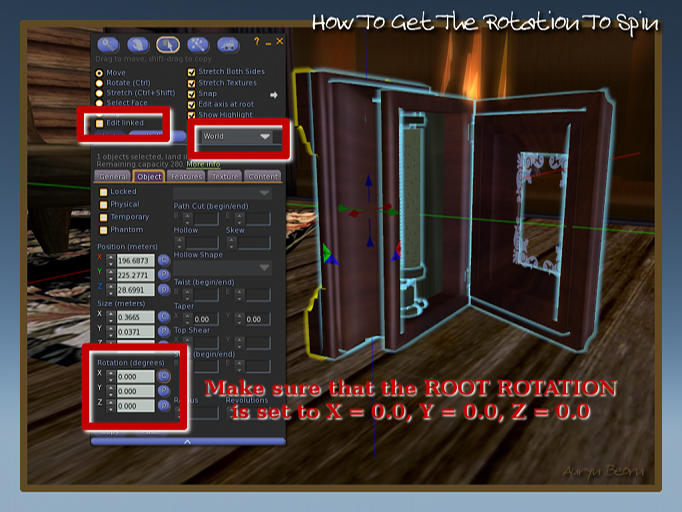 You will be able of rotating it again as you wish ONCE you have gathered the values for the spin vectors. Rez the [Black Tulip] Snowglobe - SCRIPTED SAMPLE sample object to follow this explanation. The captures are taken with a different object, but the principle is the same: pay special attention to the sections of the diagram that are highlighted. Now go into Edit linked parts. Click the winding key. The first that we have to know is that the script will read the semicolons (;) and take all the values between them. It is VERY IMPORTANT the order these values appear! If they don't appear in this exact order, the script won't be able to read the values of the prim we want to spin. What each of those values mean? means that the script has to consider this prim as a spinning one. The word has to be written exactly as said above. It IS case sensitive! is the spin vector. Don't worry, it is explained after this how to obtain it correctly. is the spin rate value. It is a number with decimals that, to make it easy to understand, we can think of as the velocity, so the smaller the value we type in, the slower the piece will spin and the reverse. This last value corresponds to the gain parameter the wiki mentions there. And how the spin vector has been obtained? 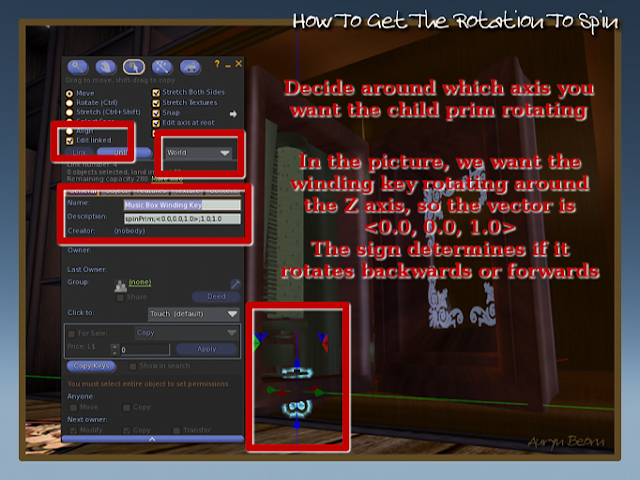 With the object having the root rotation set to <0.00 ,0.00, 0.00> (as stated above), and being in WORLD COORDINATES mode, we choose the axis we want the object rotating around. You would expect that the SIZE of your snowglobe affected somehow to the snow emitted, and in fact, this happens by using this tool. If your SNOW EMITTER PRIM is smaller, the particles effect covers less volume. If bigger, it covers more. It attempts to always fill the snowglobe, INSIDE. To be able to achieve this, the script, internally, takes the smallest dimension of the prim where you say the snow will emit, and it will adapt the effect to that smallest dimension. Example: if the size of the primitive you decide to be the snow emitter is X = 1.0, Y = 0.5, Z = 2.0, then the script will take 0.5 to decide how far the particles will get. From this, a DESIGN TIP is that you set the SPHERE that snowglobes use to have as the primitive emitting snow (you can see that in fact in the sample object included). The sphere of the snowglobe will have the same size for X, Y, Z, or at least, very similar sizes among them, so the snow effect will adapt nicely to the size of your snowglobe. You have example AVpos and .MENUITEMS notecards with your purchase. Remember that this works too with AVSitter 2. Q: I click the animated texture/light/particle options on the menu, but no visible outcome shows. What's going wrong? A: Most likely, there's not a light source/particles source/animated texture source defined in the object. Double-check the DESCRIPTION of the prim you expect to be a SL light source/particles source/animated texture source.